What are you doing these days? What are ye up to? Do you still cruise the electric bike? Does the helmet still fit? Sanded anything with your purple machine, making files, gee I miss all that stuff! This is my favorite lathe -- the Rolls Royce of lathes, naturally. While mine is quite different in construction, size, and probably well let's admit it, quality, there's something about it's classic style that influences what I do with this lathe. Within the bounds of my skills and what I have to work with. no wonder why its your favorite lathe, what a beauty it is. Thanks for the concern. I've kinda lost the plot the last couple years. Been doing stuff that's too mad for Madmodder. See this, for example. And try not to get a fright! And boy was that video a flop. I think I posted it at the worst possible time since youtube had just changed its algorithms to bury anything that isnt a top 10 lifehacks finger family kids react cringe compilation video, plus it's a weird niche topic. At some point i'm going to get into the 3d printer game - I've had a couple false starts and i'm distracted with another project. I think 3d printers are silly and overhyped, but for the urethane masks featured in that video it'd probably be the ideal tool to eliminate the messy expensive moulds and toxic chemicals. I'd like to make a thread for that when I get around to it. Really I should've made a thread about that mask since alot of the stuff involved is fairly interesting. At least I think it is. But it's taken me this long to get over the embarrassment. That is a nice lathe! I've got a bookmarks folder of various tiny lathes i'd say I look at once every couple weeks, and that's one of them. My personal favorite are the Pultra lathes. I keep forgetting they're English made. Something about them feels French to me. The French are good at being just that little bit weird, but in a very appealing way. I've kinda lost the plot the last couple years. Been doing stuff that's too mad for Madmodder. See this, for example. And try not to get a fright! ...... I'd like to make a thread for that when I get around to it. Really I should've made a thread about that mask since alot of the stuff involved is fairly interesting. At least I think it is. But it's taken me this long to get over the embarrassment. Simon that was FANTASTIC! I don't know what you're talking about... "embarassment"
What a tour of creative methods and problem solving, and I love the nuttiness of it, gets well past the boring YT videos for me of ten minutes of explanation of what someone is about to do, then twenty seconds of doing it, and another 5 minutes of recap and a plea to click and subscribe. In your case I actually have to slow down the video to catch everything I'm interested in, man you trim things to the bone! Wait, what'd he do just then??? Did he just iron a drainpipe? Does he always cut towards his fingers? Wow, cool, etc. You ought to be proud of that. ps. my 12 yr old daughter loves fenuc foxes, but apologies if I'm wrong in my guess here. You HAVE to at least post a link to this video in the Composites and Plastics section of Madmodder. And an apology for not trusting that we're all at least as mad as you are. Plus we'll probably double your hits for that vid. Simon, you're desperately needed here! Hey that Pultra is also one I love. Very stylish and simple lines. You know, there's engineering, and then there's design. And when good examples of both come together in one object, that's art. The word art is one that has had its true meaning lost. It's not just paintings on walls, or sculptures. It's skill at empowering objects with something beyond the ordinary. Hey Neubert, sorry I missed your comment a few minutes ago. Thank you kindly as well, too, buddy! It's people like you that spur me on to get moving and posting! You make this fun.. Frankly, I like the lines of yours much better than either of those examples! Bring on the brass, and lovin' those acorn nuts! Andrew....? Think you could do it? Hah. Well for myself I was calling it 'the last bastion of sincerity' but i'm not sure if that applies any more - it's changing rapidly. With the megasites like various social media platforms, youtube, and reddit the internets been getting way more cynical and any sense of community or shared involvement has been pulverized. But the furry community resisted that change for a while because it was just too dang weird. But it's still a sizeable demographic of consumers and more and more people are starting to realise and try take advantage of that and driving the genuinely weird and interesting stuff underground. Plus in this day in age alot of people my age, and maybe myself included, are starved for a sense of purpose and identity. Hence the rise of Identity Politics. And the whole community looks like exactly that - a community, and a neat identity to wear and show off on your lapel. There's perhaps nothing wrong with that, but it's also making it alot easier for carpetbaggers to exploit. A recent news story that's been making rounds is that there's now Chinese factories cranking out fursuits to try cash in on it, which is something I was jokingly predicting a few years back. That still skips over explaining what it actually is. But whatever it was, i'm not sure if that exists any more. Yes definitely if I could get at the Mirac lathe. It's all a bit tight in the workshop for some reason ! Heh, Simon, I just meant write here about what you do by way of making things, and don't worry about the consequences or perceptions. The interesting part for all of us is that people make things, and particularly out of the ordinary things, with their own zeal for it. Who cares what the reasons are! And identity is nothing that can be taken away. Creativity is the evidence of an identity. No need for explanation or apology for making something unusual. This mad modder forum is exactly for that kind of expression. We don't have a high tolerance level for web cruising critics here. I know you're busy Andrew, but if you ever did get around to making one 5/16-18, I'll twist off a store-bought one from my lathe and put on an honorary genuine Mawson nut! No jokes, please, I already get it! Actually that would be a cool idea for a Mod-up -- anybody out there who wants to tackle a 5/16-18 brass acorn nut CNC or hand-turned can do that, and it will find a place on the lathe. Just open a thread and post some photos of your project in the Mod-Up section of this forum. Should be an interesting exercise in creativity and methods -- an acorn nut has a ball end, hex section and deep blind thread. Not so simple. I'd be happy to have MM nuts on my lathe. And no jokes about that! Making is a zen thing for me; I'm almost dead to the world focused on today's thing. The earmuffs don't help that one either. The face does look realistic, I'll give you that! Okay back to the lathe. Today I cut out the interfering top bit of the aluminum stepper enclosure, and moved the headstock back to it's furthest aft position. This lined the drive pulleys up properly. I fitted the rear bearing cover and felt. But I found it was all too tight and it restricted the aluminum spindle spacer from rotating, even though I had tightened up on the spindle nuts to pre-load the spacer against the bearings. 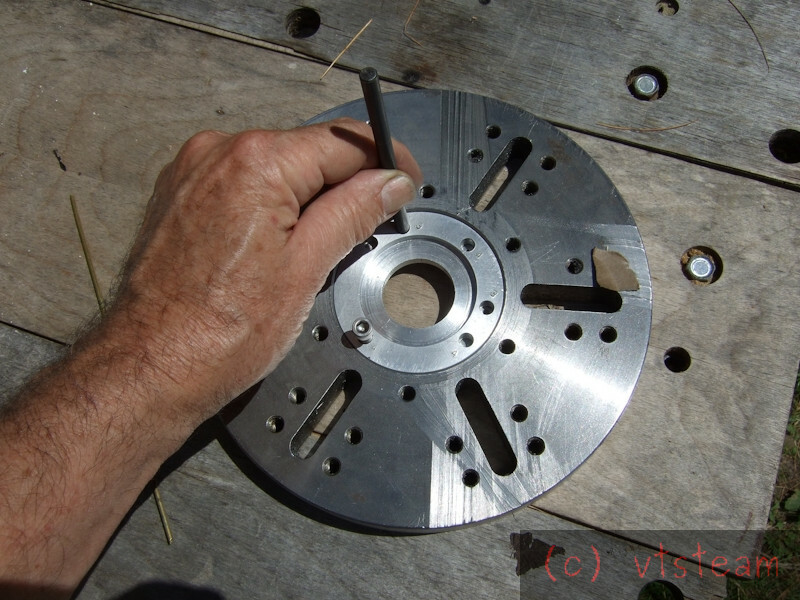 The spindle just rotated inside of the spacer. So I decided to forgo the felt on the rear bearing cover -- I think the cover fits closely enough without it. The spacer and the big adjacent drive pulley will also block swarf, and this is the rear of the headstock anyway. The Minilathes don't have any packing here, so I'm going to call it good without felt. The front bearing cover felt is fine. Then I made up a flat 3/8" by 1-1/2" flat steel bar to fit across the top of ways inside of the headstock. This is the clamp that will will hold it stationary, along with a flat plate of 1/4" steel that is already there beneath the ways. 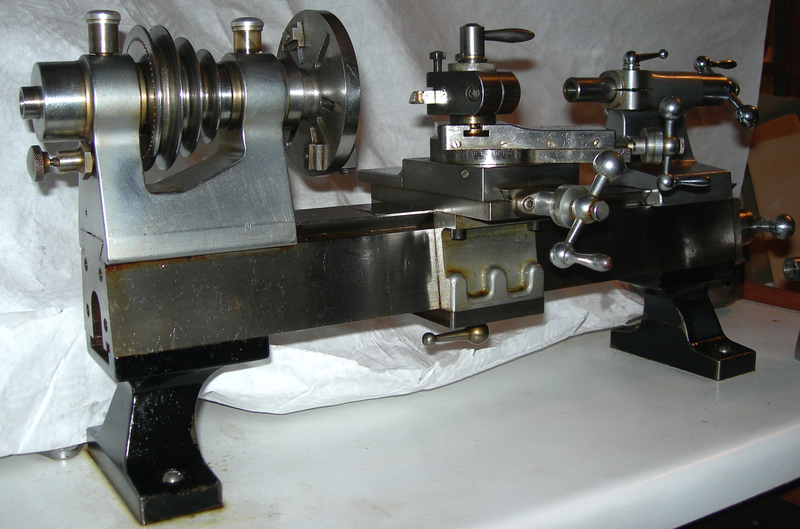 That one runs the full length and width of the headstock, and served as a slide, while boring for the spindle. The .008" shims used when it was a slide have been removed, so tightening its 4 attachment screws will also clamp the headstock. But in addition I drilled and tapped the new clamp bar 3/8-16 right in the center, and drilled a 3/8" clearance hole in the bottom plate. To finish clamping the headstock permanently I only needed a 3/8" by 1" bolt. Searching everywhere I could think of I could find NO 3/8 bolts whatsoever. That always seems to happen. 20 minutes of wasted time rummaging through toolboxes, cans full of old fasteners, not to mention the normal bolt storage places. Finally I grabbed a 1" length of 3/8" all-thread, took a grinder to the end and to a 3/8" nut, smeared some flux on it and silver brazed them together to make a bolt. Nothing's stopping me! The result-- the headstock is now permanently fixed to the lathe. Covers are done. Spindle turns. Pulleys line up. I think it's probably time to open up the cap one more time and grease the roller bearings -- a task I was avoiding 'til the very end of headstock work. I dunno -- First I might just split the rear bearing cover like the front one. Otherwise it's a lot more involved removing the cap. If I split it, all I have to do to open up the headstock and inspect or remove the spindle/ bearing, and pulley assembly is loosen the 4 acorn nuts. I like that. Knock on wood Neubert! It was a bad day for me yesterday! I should say dumb day. I spent a lot of the day making up a plug gauge out of aluminum. Spoiled the first attempt a couple hours into it. And started on a second. 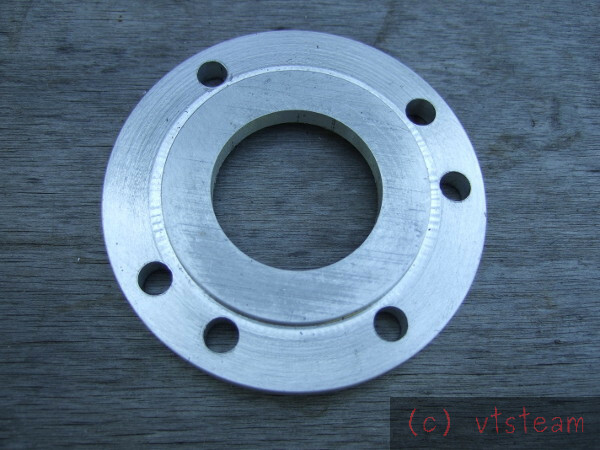 This plug was intended to, on one face, mimic the spindle flange, register, and bolt hole pattern, and on the other face, mimic the receiving end of any chuck, faceplate, etc. To find the proper hole locations I placed the receiving face on the spindle flange, and transfer punched the hole pattern onto my new plug gauge. Then step drilled it to match. When finished, I planned to turn it around and place the plug into the recess side of the faceplate, transfer the hole locations, and then drill and tap bolt holes on the faceplate to exactly fit the spindle. That was the idea, anyway. 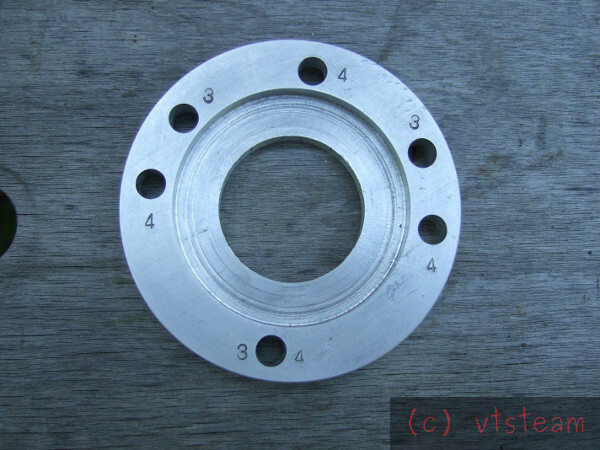 When after the second try, I had my plug, all step drilled, and even stamped to indicate the three hole pattern and the four hole pattern holes, I felt it was time well spent. It was getting to be evening, and I figured I could now easily complete the faceplate attachment and mount it on the lathe. Uhhhh........no. Almost evening, and I'd left my glasses in the house. No problem I could see the transfer punch marks on the faceplate well enough, couldn't I, and heck, the 1/16" starter drill I was using fit well into those punches (which I'd even filed the burrs of of). It will find its center in the divot even if I'm off. I drilled the three hole pattern with the first drill, then followed with a 1/8" spotting drill, and ..... and ..... and.... wait a minute. 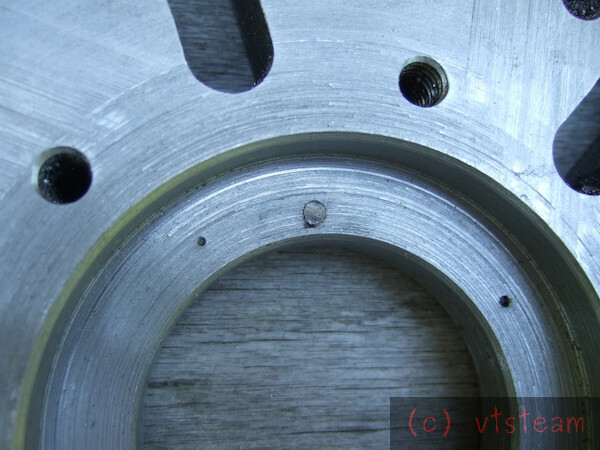 One of those three enlarged holes now looks awfully close to the register bore. That's not the same as the others...........whaaaaaaaaaaaaaaaaaaaaaaaaaaaat? No, man, you do need glasses. Freakin dummy! Well, guess you're going to have to drill the 4 bolt pattern instead, and just re-use one of the good holes. So I start on that, I've got my glasses after a trip to the house, I've punched more locations and I've got two of those holes done with the 1/16th" drill, working on the third and last when it starts making an odd clicking sound -- maybe I better do another peck, been drilling this one too long and it's jamming up, I bet -- I go to lift it and bit snaps off clean in the hole. Whaaaaaaaaaaaaaaaaaaaaaaaaaaaaaat? Man why didn't you drip some cutting oil on that spot first???????!!! -- the can is sitting not 6 inches from the drill press. What a mokohead!!!!! Okay, now what? Shift the whole thing and start again? That really frosts me! I've made a mes of it. Just stop what you're doing and call it quits for the day. Let it go before you wreck something else. Sleep on it and start again tomorrow. Okay, so now it's a bright new sunshiney day. And this morning I woke up thinking......is this possible: maybe plug the first hole with steel and re-spot it and try drilling it again for the three hole pattern? I don't want to use heat (brazing, welding) to fill it with metal -- I don't want to warp that faceplate or register. But what if I plug it with a bit of 1/8" steel rod, and say some JB Weld epoxy? That stuff has done wonders for other problems in the past. So this morning I hunted up a piece of water hardening 1/8" drill rod -- fully annealed, it just barely scratched the faceplate, so my guess is they are about the same hardness. 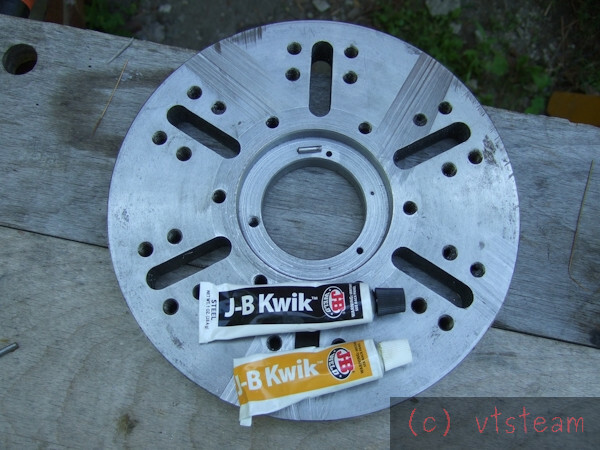 And some JB Kwik (somewhat faster cure then the standard JB weld. I cleaned out the hole well with lacquer thinner, and the same for the drill rod, clamped it in the vice and sawed off a small peg. Then I carefully swabbed the hole with epoxy, lightly coated the peg, and drove it home. The top burr prevented it from dropping below the surface (which would have defeated the whole re-drill attempt). Will this work? I don't know. But we'll try it anyway. The sun warmed the faceplate quite a bit -- nearly too hot to hold in an hour, so I figured the epoxy was well set -- the bit I had mixed up on the card was pretty hard. I carefully ground down the peg's top burr with a Dremel tool, and then screwed the plug gauge in place in the faceplate register. I'd drilled and tapped just one of the through holes earlier to serve as a reference point while marking out the other holes.